“In our time,” wrote George Orwell in 1946, “political speech and writing are largely the defense of the indefensible.” British colonialism, the Soviet gulag and America’s dropping of an atomic bomb, he argued, “can indeed be defended, but only by arguments which are too brutal for most people to face.” So how do people defend the indefensible? Through “euphemism, question-begging and sheer cloudy vagueness.” By obscuring the truth. So it is, more than 70 years later, with Israeli policy toward the Gaza Strip. The truth is too brutal to honestly defend. Why are thousands of Palestinians risking their lives by running toward the Israeli snipers who guard the fence that encloses Gaza? Because Gaza is becoming uninhabitable. That’s not hyperbole. The United Nations says that Gaza will be “unlivable” by 2020, maybe sooner. 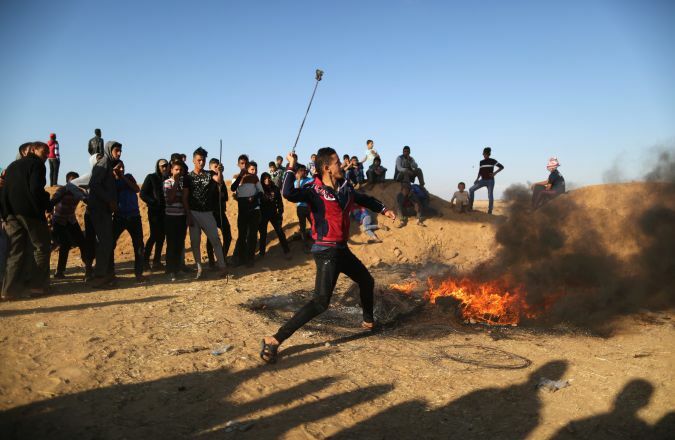 Hamas bears some of the blame for that: Its refusal to recognize Israel, its decades of terrorist attacks and its authoritarianism have all worsened Gaza’s plight. Mahmoud Abbas’s Palestinian Authority bears some of the blame too. So does Egypt. But the actor with the greatest power over Gaza is Israel. Israeli policies are instrumental in denying Gaza’s people the water, electricity, education and food they need to live decent lives. How do kind, respectable, well-meaning American Jews defend this? How do they endorse the strangulation of 2 million human beings? Orwell provided the answer. They do so because Jewish leaders, in both Israel and the United States, encase Israel’s actions in a fog of euphemism and lies. The fog consists, above all, of three words — “withdrew,” “security” and “Hamas” — which appear to absolve Israel of responsibility for the horror it oversees. These are anesthetizing fictions. Yes, Israel withdrew its settlers and soldiers in 2005. But Israel still controls Gaza. It controls it in the way a prison guard might control a prison courtyard in which he never actually sets foot. First, Israel declares parts of Gaza off-limits to the people who live there. Israel has established buffer zones — it calls them Access Restricted Areas — to keep Palestinians away from the fence that separates Gaza from Israel. According to the United Nations, this restricted area has ranged over the past decade from 100 to 500 meters, comprising as much as one-third of Gaza’s arable land. People who enter these zones can — and over the years have been — shot. In addition to barring Palestinians from much of Gaza’s best land, Israel bars them from much of Gaza’s water. In 1993, the Oslo Accords promised Gazan fisherman the right to fish 20 nautical miles off the coast. But since then, Israel has generally restricted fishing to between three and six nautical miles. (Occasionally, it has extended the boundary to nine nautical miles). Since sardines, which the United Nations calls Gaza’s “most important catch,” “flourish at the 6 NM boundary,” these limitations have been disastrous for Gazan fisherman. The second way in which Israel still controls Gaza is by controlling its borders. Israel controls the airspace above Gaza, and is has not permitted the reopening of Gaza’s airport, which it bombed in 2001. Neither does it allow travel to and from Gaza by sea. This doesn’t excuse Egyptian leader General Abdel Fattah el-Sisi, who to his discredit, has largely kept the Rafah crossing closed since he took power in 2013. But even when Rafah is open, it isn’t a significant conduit for Gazan exports. As Sari Bashi of Human Rights Watch explained to me, there is little market in Egypt for goods from Gaza, both because those goods are expensive for Egyptian consumers and because transportation across the Sinai is difficult. So when it comes to goods leaving Gaza, the Strip is largely under Israeli control. Finally, and perhaps most profoundly, Israel controls Gaza’s population registry. When a child is born in Gaza, her parents register the birth, via the Palestinian Authority, with the Israeli military. If Israel doesn’t enter her in its computer system, Israel won’t recognize her Palestinian ID card. From Israel’s perspective, she will not legally exist. This control is not merely theoretical. If Israel doesn’t recognize your Palestinian ID card, it’s unlikely to allow you into, or out of, Gaza. And because Israel sees Palestinians as a demographic threat, it uses this power to keep the population in Gaza — and especially the West Bank — as low as possible. Israel rarely adds adults to the Palestinian population registry. That means that if you’re, say, a Jordanian who marries someone from Gaza and wants to move there to live with her, you’re probably out of luck. Israel won’t let you in. Israel is even more zealous about limiting the number of Palestinians in the West Bank, where it still has settlers. So when Palestinians move from Gaza to the West Bank, Israel generally refuses to let them update their addresses, which means they can’t legally stay. Israel can even prevent children in Gaza from changing their address to the West Bank to live with a parent. Let’s say a child lives with her mother in Gaza but has a father in the West Bank. If the mother dies, and Israel deems there to be a suitable caretaker in Gaza, it can use that as grounds to deny the child the right to legally reunite with her father in the West Bank. You won’t hear about this at the AIPAC Policy Conference. But in these and myriad other ways, Israel constrains the lives of virtually every person in Gaza. As the indispensable Israeli human rights group Gisha has observed: “Gaza residents may not bring a crate of milk into the Gaza Strip without Israeli permission; A Gaza university cannot receive visits from a foreign lecturer unless Israel issues a visitor’s permit; A Gaza mother cannot register her child in the Palestinian population registry without Israeli approval; A Gaza fisherman cannot fish off the coast of Gaza without permission from Israel; A Gaza nonprofit organization cannot receive a tax-exempt donation of goods without Israeli approval; A Gaza teacher cannot receive her salary unless Israel agrees to transfer tax revenues to the Palestinian Ministry of Education; A Gaza farmer cannot get his carnations and cherry tomatoes to market unless Israel permits the goods to exit Gaza.” Claiming that Israel divested itself of responsibility for Gaza when it “withdrew totally” in 2005 may ease American Jewish consciences. But it’s a lie. It’s a lie that keeps American Jews from reckoning with the effect Israeli control has had on ordinary people. In three wars — in 2008-2009, 2012 and 2014 — Israeli bombing damaged roughly 240,000 Gazan homes. According to The New York Times, Operation Cast Lead alone, in 2008-2009, cost Gaza’s economy $4 billion, almost three times the Strip’s annual GDP. Operation Protective Edge in 2014 damaged or destroyed more than 500 schools and preschools, affecting 350,000 students. This destruction, along with Gaza’s rapid population growth, has created a massive need for infrastructure and services. But Israel’s buffer zones and partial blockade make it impossible for the Strip to effectively rebuild. Over the past three years, Israel has, to its credit, loosened restrictions on goods coming in and out of Gaza. Still, the United Nations reports that, in large measure because of “continued export restrictions” and “restrictions on import of material and equipment necessary for local production[B3],” Gaza exported less than one-fifth as much in 2016 as it had in the first half of 2007. The consequences of this economic collapse have been profound. According to the United Nations, roughly half the people in Gaza are “moderately-to-severely food insecure,” up 30% from a decade ago. Hospitals lack essential drugs. A shortage of teachers and buildings has forced many schools to run double and even triple shifts, which means many children attend school for only four hours a day. (By withholding donations to the United Nations Relief and Works Agency, which runs many of Gaza’s schools, the Trump administration will likely make this worse). Most people in Gaza receive only a few hours of electricity per day. Abbas — who in an effort to weaken Hamas last year slashed the amount he pays Israel for Gaza’s electricity — bears some of the blame for that. But so does Israel, whose export restrictions deny utility officials in Gaza the money to purchase sufficient fuel or to fully rebuild the Gaza power station Israel bombed in 2006. Most alarming of all is Gaza’s dwindling supply of water. In 2000, 98% of Gaza’s residents had access to safe drinking water through its public water network. By 2014, the figure was down to 10%. Because overpumping has damaged the Strip’s coastal aquifer, the United Nations warned last year that “Gaza’s only water source will be depleted, and irreversibly-so by 2020, unless immediate remedial action is taken.” The best long-term solution is to build a new desalination plant. But Gaza has neither the electricity nor the money to do so. Israel is not a bystander in this catastrophe. It is a primary cause. If pressed on these realities, American Jewish leaders will concede that the suffering in Gaza is deeply unfortunate. But they will deploy a second term to justify the situation: “security.” Read statements on Gaza by AIPAC and The Anti-Defamation League and you’ll encounter the term “security blockade.” The implication is clear: Israel only harms people in Gaza when it is absolutely necessary to keep Israelis safe. But this, too, is false. Certain elements of the blockade do have a plausible security rationale. Israel, for instance, restricts Gaza’s import of many “dual-use” products, from cement and steel to cranes, x-ray machines and smoke detectors to wood planks thicker than 5 centimeters to even the batteries and spare parts needed to power children’s hearings aids. The economic and humanitarian consequences of these restrictions are often grave. And Israel’s definition of “dual-use” is far broader than international standards. Still, most of the products Israel restricts could be used for attacks on Israel, so there’s a security rationale for restricting them. One can also argue that Israel’s buffer zones and restrictions on fishing serve Israeli security. If Palestinians are kept away from the fence, the rockets they launch into Israel can’t travel as far. If Palestinian boats are kept nearer the coast, they are easier for the Israeli navy to track. Given the harm that these limits cause farmers and fishermen, Israel should pay them compensation. It should also compensate those Palestinians who suffer from Israel’s import restrictions. But whether one thinks these restrictions justify the human cost, it’s at least possible to divine the security rationale that underlies them. When you examine Israel’s travel restrictions, however, and its restrictions on Gazan exports, AIPAC and the ADL’s security rationalizations largely collapse. With rare exceptions, students from Gaza cannot travel to the West Bank to study. Academics and researchers in Gaza cannot normally leave to attend international conferences, nor can foreign academics visit the Strip. Families in Gaza cannot travel to the West Bank or Israel proper to see their families unless a “first degree relative” (parent, child, sibling) gets married, dies or is about to die. Letting someone leave Gaza to visit his dying grandparent is an unacceptable security risk, evidently, while letting them leave to visit a dying parent is not. Israel’s blockade on exports is similarly vast and arbitrary. Israel allows farmers in Gaza to sell tomatoes and eggplants to Israel but not potatoes, spinach and beans. It allows them to export 450 tons of eggplant and tomatoes per month but not more. Spinach, evidently, is more dangerous than eggplant. And 500 tons of eggplant and tomatoes are more dangerous than 450. From a certain ultra-myopic perspective, even this has a security rationale. If you see every person leaving Gaza only as a potential terrorist and every container only as the potential hiding place for a bomb, then the fewer people and goods that leave Gaza for Israel or the West Bank (which unlike Gaza, still contains Israelis), the safer Israel is. What this ignores is that terrorism doesn’t only require opportunity; it also requires intent. And when you bankrupt a Gazan farmer by blocking his exports or crush a Gazan student’s dreams by denying her the chance to study abroad, you may breed the desperation and hatred that produces terrorism, and thus undermine the very Israeli security you’re trying to safeguard. The dirty little secret of Israel’s blockade is that elements of it are motivated less by any convincing security rationale than by economic self-interest. In 2009, Haaretz exposed the way Israeli agricultural interests lobby to loosen restrictions on imports into Gaza when Israeli farmers want to sell surplus goods. In 2011, Israel found itself with a shortage of lulavs, the palm fronds that observant Jews shake on the holiday of Sukkot. So Israel lifted its ban on Gaza’s export of palm fronds. Had the security risk suddenly changed? Of course not. What had changed were the needs of Israeli consumers. When you think about it, this isn’t surprising. The Israeli government is accountable to Israeli citizens. It’s not accountable to the people of Gaza, despite wielding enormous power over their lives. When governments wield unaccountable power, they become abusive and corrupt. Why does Israel maintain a blockade that is not only cruel but, in some ways, absurd? Because it can. Hamas is indeed a brutal and destructive force, to both Israelis and Palestinians. It has a long and ugly record of terrorist attacks. It does not recognize Israel. Its Islamist ideology is deeply oppressive, especially to women, LGBTQ Palestinians and religious dissenters. But Hamas did not force Israel to adopt the policies that have devastated Gaza. 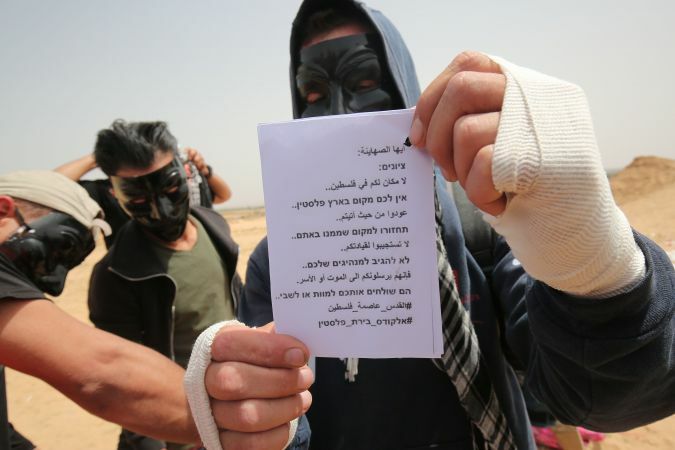 Those policies represent a choice — a choice that has not only failed to dislodge Hamas, but has also created the very conditions in which extremism thrives. In January 2006, four months after Israel withdrew its settlers from Gaza, Palestinians in the West Bank, Gaza and East Jerusalem went to the polls to elect representatives to the Palestinian Authority’s parliament. (Palestinian president Mahmoud Abbas was elected separately a year earlier). Hamas won only 45 percent of the vote. But because Fatah — the comparatively secular party founded by Yasser Arafat — ran multiple candidates in many districts, thus splitting the vote, Hamas gained 58 percent of the seats. But when the PLO publicly recognized Israel in 1988 and reaffirmed that recognition at the start of the Oslo Peace Process in 1993, Hamas’s rejectionism became impossible for Israel to ignore. Hamas denounced the PLO for recognizing Israel. And during the Oslo Process and the Second Intifada that followed, Hamas launched numerous terrorist attacks. It’s not surprising, therefore, that Israel did not welcome a Hamas-led government. Israel could have embraced this. Even in a unity government, Abbas — who had been elected separately — would have remained president. It was widely assumed that if he reached a peace agreement with Israel, Palestinians, like Israelis, would vote on it in a referendum. The crucial question, therefore, was not whether Hamas as a party endorsed the two-state solution. (After all, Benjamin Netanyahu’s Likud Party had never endorsed the two-state solution.) The crucial question was whether — if the Palestinian people formally endorsed a two-state deal — Hamas would respect their will (something Hamas later pledged to do). Had Hamas, or any other Palestinian faction, committed acts of violence, Israel would have retained the right to respond. That was the path not taken. Instead, the United States and Israel demanded that Hamas formally foreswear violence, embrace two states and accept past peace agreements — a standard that Netanyahu’s own government does not meet. Hamas, which spent the Oslo years calling the PLO dupes for recognizing Israel without getting a Palestinian state in return, refused. So Washington and Jerusalem pressured Abbas to reject a national unity government and govern without a democratically elected parliament. Then, in 2007, the Bush administration encouraged Abbas’s national security advisor, Mohammed Dahlan, to oust Hamas from Gaza by force, a gambit that backfired when Hamas won the battle on the ground. And with Hamas now ensconced in power, Israel dramatically tightened its blockade of Gaza, which it has maintained — with modifications — ever since. The result: Gaza has been devastated, and Hamas remains in power. Which brings us to the current protests. The Israeli government’s American defenders insist that Israel cannot let thousands of demonstrators — some of them violent — tear down the fence and begin streaming toward the kibbutzes and towns on the other side. That’s true, but it misses the larger point. No government finds it easy to quell mass protests. The deeper question is always: What has that government done to address the grievances that sparked the protests in the first place? For more than a decade, Israel’s answer to the problem of Gaza has been collective punishment and terrifying force. For stretches of time, this has kept Gaza quiet. And it may again. In the coming weeks, Israeli soldiers may kill and maim enough protesters to scare the rest back into their prison enclave. But sooner or later, Gaza will rise again. And the longer Israel suffocates its people, the more desperate and vengeful their uprisings will become. A 10-year-old in Gaza has already endured three wars. According to the United Nations, three hundred thousand children in Gaza suffer from post-traumatic stress from the 2014 conflict alone. Do Israeli and American Jewish leaders really believe that brutalizing them even more by denying them adequate food, education, electricity and water will make them more likely to live in peace with Israel? By maintaining its blockade, Israel is not pushing Gaza’s next generation toward coexistence. It’s pushing it toward ISIS. The alternative is a strategy built not on collective punishment but on hope. It would begin with dismantling much of the blockade. Israel has the right to search cargo entering and exiting leaving Gaza. It has the right to investigate people traveling to and from there — and to restrict their movement if it finds evidence they’re a threat. But there’s a vast difference between restricting the movement of particular individuals that you have reason to suspect of terrorism and restricting entire classes of people based on no individual suspicion at all. There’s a vast difference between restricting certain imports that could be used to construct tunnels or bombs and prohibiting the export of potatoes and beans. Except when there’s a clear, specific danger, Israel should allow the people of Gaza to study, travel, trade and gain the resources to live decent lives. Doing so would not only be humane. It would also be wise. Israel will be safer when people in Gaza have something to lose. A strategy of hope would involve allowing (and even encouraging) Palestinians in Gaza, the West Bank and East Jerusalem to hold free elections for the first time in more than 12 years. And that would require allowing Palestinians to vote for whichever party they choose. Israel has the right to retaliate if Hamas, or any other Palestinian faction, attacks it. It does not have the right to bar Palestinians from voting for parties that reject the two-state solution when Israelis do so all the time. A strategy of hope would mean embracing the Arab Peace Initiative and the Clinton Parameters: a viable Palestinian state near the 1967 lines. It would mean ending settlement growth, and perhaps even paying settlers to move back inside the green line so as to keep hopes for a two-state solution alive. Finally, a strategy of hope would require Israeli and American Jewish leaders to talk honestly about why 70% of the people in Gaza are refugees or descendants of refugees. Israeli and American Jews find it frightening that the Gaza protesters have labeled their demonstrations “The Great March of Return.” But surely Jews — who prayed for 2,000 years to return to the land from which we were exiled — can understand why Palestinians in Gaza might yearn for lands from which they were exiled a mere 70 years ago. That yearning does not make Palestinians anti-Semites or terrorists. If Moshe Dayan could express sympathy in 1956 for the inhabitants of “the refugee camps of Gaza” who have “seen, with their own eyes, how we have made a homeland of the soil and the villages where they and their forebears once dwelt,” why can’t today’s Israeli leaders acknowledge, and offer recompense for, the Nakba? Why is it considered inconceivable that Israel would permit the return of a single Palestinian refugee when, in 1949, a far more fragile Israel offered to readmit 100,000. Netanyahu and Trump. But who makes it absurd? To a significant extent, we American Jews do. The organized American Jewish community doesn’t only conceal the truth about Gaza from itself. It lobbies American politicians to do the same. The American Jewish establishment exports its “euphemism, question-begging and sheer cloudy vagueness” to Washington. It excoriates politicians who dare to suggest that Israel bears some of the responsibility for Gaza’s suffering. In doing so, it helps to sustain Israel’s current policies and to foreclose alternatives. The struggle for human decency, Orwell argued, is also a struggle for honest language. Our community’s complicity in the human nightmare in Gaza should fill every American Jew with shame. The first step toward ending that complicity is to stop lying to ourselves.